NTENT is pleased to announce the recognition of Dr. Ricardo Baeza-Yates, Chief Technology Officer, amongst the Night of the Telecommunications 2019 winners. 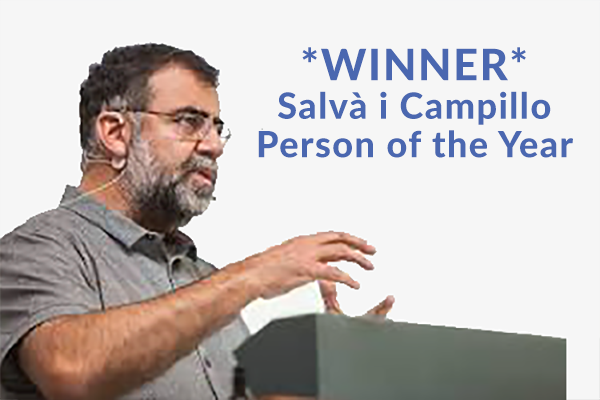 The Salvà i Campillo Award for Person of the Year has been awarded to Dr. Ricardo Baeza-Yates, CTO of NTENT, an American company focused on Conversational AI and Search. This award recognizes those who have contributed significantly to the enhancement of Electronics, Audiovisual, and Information and Communication Technologies (ICT). It honors the career of Baeza-Yates, founder of the Web Research Group at the ICT department at Pompeu Fabra University and former Vice President of Research at Yahoo Labs. Other awards presented include National Honors memorializing the work of Coderch, a telecommunication engineer from the UPC considered an expert in issues of development and energy regulation, along with awards named after Alan Turing. More information about additional awards and winners can be found here. To stay informed about Dr. Ricardo Baeza-Yates’ exciting work at NTENT, follow us on Twitter @withNTENT. NTENT provides Search and Conversational AI Platforms, empowering our partners to add search and conversational intelligence to anything. Maintain your data and direct relationships with your customers when you customize, localize and integrate our search, natural language understanding, and Q&A technologies directly into your lines of business.